San Diego is what the world could be, what the world should be. San Diego reflects the accessibility that is possible and contrasts the lack of access provided by the majority of other places. San Diego is by no means Universally Designed but relatively speaking this city takes the cake in meeting accessibility needs. 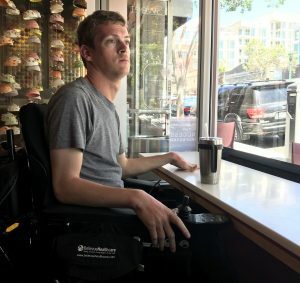 San Diego is an uncommon city when it comes to accessibility; needing to use the bathroom and finding that it is not accessible, or venturing the sidewalk and there is no curb cut to be found, or riding the transit system and having to go beyond the needed yet inaccessible station to an out-of-the-way station are all experiences more common than people may realize. 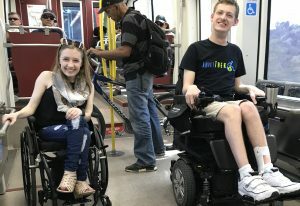 However, when Daman Wandke and Kyann Flint visited San Diego, they never once encountered a bathroom they could not use, they never came to the end of a sidewalk that lacked a curb cut, and they could access every Trolley station in which they ventured. 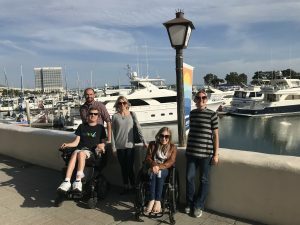 Daman and Kyann arrived in San Diego, wheelchairs intact, and they were good to go. Getting to their hotel from the airport was simple as Daman had planned ahead and booked an accessible Super Shuttle (and it actually was accessible for Daman to drive his power chair right into the rear of the van). Daman and Kyann stayed at the Handlery Hotel. Kyann had called ahead to ensure that they both could get ADA rooms with roll-in showers. Both the ADA rooms did indeed have spacious bathrooms with roll-in showers that were actually roll-in showers (no lip). The vanity was also accessible, and the bars around the toilets and in the showers were well placed. The only issue with the bathrooms was that the shower wands were placed on the opposite side of the shower than the built-in seat. It is difficult — to near impossible — to transfer to the bench and then reach the shower wand from a seated position. It would be better if the shower wand was placed on the back wall of the shower so that it is to the right or left of the bench rather than across from it. The hotel rooms themselves were not super spacious, but there was enough space in each room for Daman and Kyann to move in their chairs. The hangers were at hand level which was nice (Kyann has begun to notice this feature in more and more hotels). There were also inaccessible features within the rooms. The beds were a little high, and the refrigerators were not easily accessible. Both refrigerators were located within a cabinet that had a door that opened one way and the fridge door opened the other, making it impossible for any wheelchair user to get up to the fridge. The bed in Kyann’s room, neatly made with throw pillows but a tad high. The Handlery Hotel itself was very nice; the campus was a little spread out, and the parking lot is not well paved, but otherwise, it was pretty accessible. There were lots of ramps, so with a little asking and exploring, everywhere was accessible to Daman and Kyann. The restaurant was one accessible amenity and the staff was amazing. The “accessible” table was not accessible to Daman and Kyann; however, the second morning, the staff remembered and sat them at a different table without Daman or Kyann even needing to ask. The staff also remembered that Daman needed a straw and brought one without a request. The pool was another accessible amenity. The pool entrance was accessible via a ramp, but the alternative pool access was not (there were only stairs). Both the pool and the hot tub were equipped with lifts. The “public” bathroom in the hotel was up two ramps from the lobby, but still accessible; the bathroom stall was spacious, but the entry door was a bit heavy. The community microwaves were accessible as well, they were situated on a hand-level counter that was empty below and could be rolled right up to. A neat feature at this hotel, not common at other hotels, was an accessible counter space at the front desk. 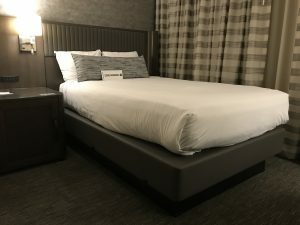 Overall, the Handlery Hotel is not the most accessible hotel that either Daman or Kyann has stayed but is relatively accessible and was nice for a super sweet deal. The sun-soaked pool surrounded by palm trees. On the first day, Daman and Kyann ventured to Seaport Village via the Trolley. The station was three blocks away from their hotel and was an easy jaunt; there were smooth sidewalks all equipped with curb cuts. The station — the Fashion Valley Station — was located up above the street and could be accessed via stairs or an elevator. Even though the platform was accessible, the ability to purchase a ticket (at least onsite) did not seem super accessible. With chest level touch screens, the kiosks, where one purchases a ticket to ride, are not ideal for any person in a wheelchair and/or who is blind. The Trolley itself, built with accessible door openers, provided a ramp up into the trolley. To enter the trolley, one must push the accessible button on the door, the door then did not open until all passengers were able to enter/exit the trolley and then a ramp slid out onto the platform. Once the ramp tipped out, the accessible door opened allowing Daman and Kyann to enter the trolley. The ramp itself was not ADA grade (at the Fashion Valley stop), but it sufficed in allowing one who motates via wheels to enter the trolley. Kyann did need some extra assistance, but with a push, she was up and in. Once inside, seats could be folded up out of the way (similar to a city bus) so that wheelchair users had space and did not feel like they were in the way of other travelers trying to navigate the trolley. Exiting the trolley is pretty similar to boarding. Right before Daman and Kyann’s desired stop, they had to press a button to activate the ramp (this could be easily done by pushing a button on the folded up seat — like on the city bus). Once the trolley came to a stop, the ramp would tip out and the doors would open allowing Daman and Kyann to exit the trolley. Their first stop, Seaport Village. When Daman and Kyann exited the trolley, they ventured the three blocks or so to the Hyatt Hotel that stands tall above Seaport Village. Daman has been to San Diego before and knows the Hyatt as the most accessible, direct route to the where they wanted to go. As they passed through the extravagant hotel, Kyann marveled at the gorgeous architecture and tile work throughout. Once on the other side of the hotel, Daman and Kyann utilized a convenient and appropriately graded ramp and trekked on to explore the wonders of Seaport Village. Seaport Village is an accessible area right on the water in San Diego. There are many different shops and restaurants. All the entrances were accessible, but to varying degrees; some entrances were a little steeper than others and some shops did not have a ton of space for moving about with ease. Kyann really enjoyed shopping at the Mugger (a mug shop) but it had tight quarters; this shop would be difficult to navigate for a power wheelchair user (hence Daman stayed outside). There are also many flat pathways around the harbor which makes it a gorgeous place to stroll. Overall, if you can handle the bumpy terrain of the beautiful cobblestones throughout, it is accessible and a must-see site to visit. 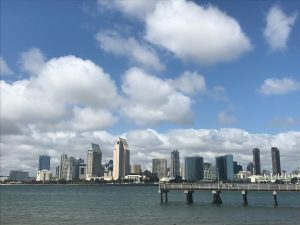 For the second full day in San Diego, Daman and Kyann decided to venture across the harbor to Coronado Island with the beach in mind. But first, they had to take a ferry. They traveled back to Seaport Village and walked down to the ferry landing at the Convention Center Marina. However, the ferry that was able to accommodate them was broken. The captain informed them that they would need to walk across Seaport Village and catch the ferry at Broadway Pier.They began the mile and a half jaunt to find their ride to Coronado Island. 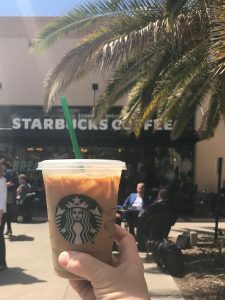 On their way to Broadway Pier, they took a detour to purchase iced coffees at Starbucks. Starbucks itself did not have an automatic door. But people were extremely friendly and opened the door for Daman and Kyann. Inside, Starbucks was a relatively big store, but it was extremely cramped due to tables and displays dispersed throughout and many, many people waiting for their beverage of choice. This Starbucks did not have its own bathroom; however, the public bathroom situated in the complex was accessible. Even though the main door seemed heavy, once inside the amenities were very accommodating with an extra large walkway and an oversized accessible stall. Back on track to get to the ferry landing on time, Daman and Kyann arrived as the ferry was docking. Daman and Kyann were able to roll down a ramp to the dock, and then ramped right up into the ferry. While the upper deck of the ferry was not accessible, Daman and Kyann could enjoy the scenic view through giant picture windows; some even opened to allow the sea breeze to circulate throughout the cabin. Once anchored, Daman and Kyann exited the ferry. They had to travel up a steep ramp and onto a long dock. Then they rolled right up to Coronado Landing — another area via a short ferry ride from Seaport Village — full of cute, little shops and restaurants right on the water as well. Overall, this is also a pretty accessible area to visit! And, this area is paved so no need to endure any cobblestones. After exploring shops at Coronado Landing, Daman and Kyann decided to trek across the island to Coronado Beach. There they found the switchbacks down to the lifeguard station where they rented powered beach wheelchairs.This beach is one of a few that have powered beach wheelchairs that can be checked out for free. 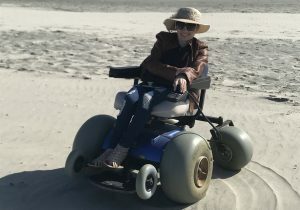 There are also the more typical manual beach wheelchairs that are also available. 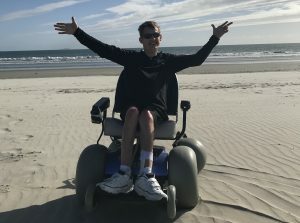 Daman enjoyed returning to the sand and Kyann experienced the freedom of independently gliding across the sand for the very first time. The lifeguards were kind and helpful as well. A relaxing dinner at Peohe’s followed the bus ride back to the landing. The interesting thing about Peohe’s was its very odd layout. There were so many ramps that both Daman and Kyann ended up traveling up a ramp, up again, through the middle of the restaurant, and then down another ramp and around the corner to get to the deck to eat outside. But the trek through the maze was worth it; Peohe’s brought delicious food and a magnificent view of the water, the sunset, sailing ships, and a view of Seaport Village and the San Diego Padres baseball game across the harbor. 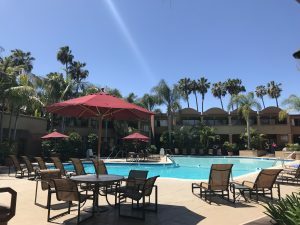 The return back to Handlery Hotel included taking the same ferry in the reverse direction, but instead of walking along the harbor back to Seaport Village, Daman and Kyann walked several blocks up from the water and boarded the Trolley at the Santa Fe Station. 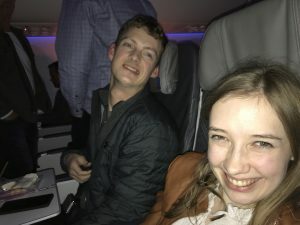 The final day of their trip (as they flew home that night), Daman and Kyann left their luggage in the locker room at their hotel, and traveled via the Trolley to Little Italy, near County Center. Little Italy was about two blocks long filled with many Italian restaurants and Italian-like shops. One shop in particular, not necessarily Italian, that both Daman and Kyann loved was iDessert. Props to this sweets shop that was incredibly accessible. This shop had accessible tables AND even had an accessible bar table, equipped with stools, across one window. The bathroom was also quite accessible. Little Italy was not as accessible as Seaport Village or Coronado Landing but it was manageable. Overall, San Diego was very welcoming. Most sidewalks were not just equipped with curb cuts but were wide as well, and the crosswalks not only had chirpers but automation that gave a countdown, “three, two, one, do not walk.” However, there were some not so accessible features of San Diego. On top of many cobblestones, the least accessible feature of San Diego was its Trolley pay stations. This was not only because of the high touch screens but because the pay stations were only located on one side of the tracks; while walkers could run across the tracks, people using wheelchairs must go out of their way to purchase a ticket (this is a good reminder to plan extra time when traveling). And then there is the airport, not necessarily the physical structure of the facility itself but the physical behavior of the TSA and the people loading passenger’s belongings onto the plane. For more on this part of the story, check out Part I of this post. Daman and Kyann were able to complete many reviews on AbiliTrek’s almost completed platform. Watch for the reveal of AbiliTrek’s new and improved service, coming soon!